The CK-230 Rigid head torch is in the "2" series family of TIG Torches and is perfect for demanding, high-amperage TIG welding jobs. The CK-230 series is the most popular water-cooled torch for 80% of all general purpose TIG welding applications. They are small, light and super powerful with short gas nozzles designed for general purpose jobs, and are perfect for heavy-duty and hobbyist applications where torch control is critical. 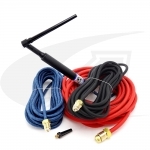 This versatile, lightweight and powerful TIG torch is the money for tough, AC and DC applications. No other TIG torch comes close to the power and performance is such a small package. 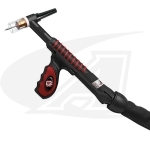 The CK-230 rigid is a good choice for welding machines like the Lincoln Precision TIG series, Miller Dynasty series, and if you have an Everlast or Longevity import machine you can greatly improve the performance by upgrading to a high-performance TIG torch package from the Pro's at Arc-Zone. The CK-230 uses the "2" Series head components (compatible with 9, 20, 280, & CS310 Parts).